Lorne Hass has been involved in the Calgary football community since in 1984 and has been a head coach for 10 of those seasons at the bantam and midget level. 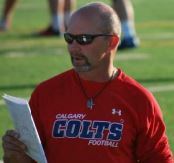 Coach Hass spent 9 years with the Calgary Colts of the CJFL as RB Coach and/ or Special Teams Coordinator as well as 1 year as director. Prior to that, he spent 22 years with the Calgary Bantam Football Association (CBFA) as a coach and director. While with the CBFA, he was selected to coach 11 Selects teams, as well as selected to coach in 4 Alberta Summer. He was also involved as coach and director of the Calgary and Area Pee Wee Football Association in the leagues’ first 2 seasons. Provincially, for 2 years he coached Team Alberta at the U18 Football Canada Cup and was responsible for the special teams as well as coaching running backs. His passion lies in more than just football but also the personal growth and development of the athletes he coaches – on and off the field. Having worked with athletes and business leaders as an executive coach, he looks forward to helping the Top-Level athletes move forward with their football, studies and life. Coach Hass has been honored to have been invited to Guest Coach with the Calgary Stampeders of the CFL and has made numerous presentations at the Football Alberta/ U of C Coaches Clinic held annually. Coach Hass lives with his lovely, supportive wife, Sandra and together they attend Rock Pointe church.